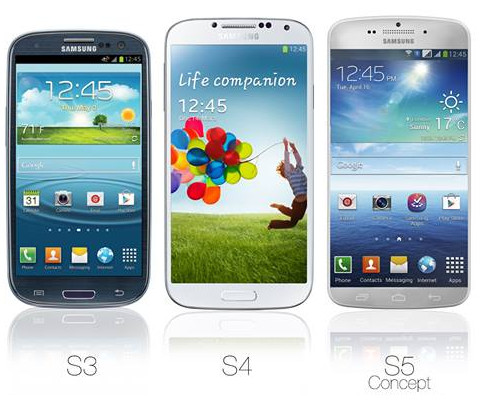 Wait, didn’t we just have a Samsung Galaxy rollout? Phone review time again at Civic Site Design. Wow, well, this one was out fast. Why the rush, Samsung? I’m still getting used to my Galaxy Note IV. Losing the micro-sd card wasn’t a bright idea, imo and I was surprised to max out while at a convention, but to be fair, I do have 6 pages of apps and hadn’t downloaded my earlier pics yet. The average user probably doesn’t need that many apps. They may accumulate them, but I like to review and clean them out once in a while, along with my photos after I upload them to social media. And pushing 1K??? C’mon, Samsung, don’t be so greedy. Keep the reasons I love you more than iPhone or you’re going to have a mass exodus on your hands. What do you think of their official introduction? Leave your comments here. Google Sky Map is the best app you could possibly hope for if you are a night sky watcher. A free, Open Source program donated by Google, over 175,000 users rate it a 5 out of 5 and with good reason. Point it anywhere, ANYWHERE, day or night, and it will show you exactly what is out there beyond planet Earth. It views stars, constellations, planets, Moon, Sun, Meteor Showers, the Horizon line, poles & Messier Objects (whatever that is). Any of these objects can be switched off with the flick of a finger for clearer viewing of your object(s) of study. Perhaps one of the more fun perks of this app is called, “Time Travel”. Choose a date and a time somewhere between the years of 1900 – 2100 and view the sky as it would appear on that date. How cool is that? The Apollo 11 moon landing and solar eclipse of May 29, 1919 are pre-loaded under popular dates, but any date and time is programmable into the interface for your viewing study and pleasure. Once in Time Travel mode, one can tap the buttons to move forward or backwards in time at the ratio of anywhere from real time (1 second to 1 second) to 1 week per second. Teach kids how the movements of the planets appear from Earth in a real neat way. Having trouble locating the object of your interest? There is a search mode. Just plug in the name of whatever it is you want to view and the app will find it for you on the map. Under the Gallery you can view beautiful shots of our sister planets, nebulas, galaxies, the Pleiades and star clusters as the Hubble telescope has caught them on its cameras. This is by far the most fun app we have come across in our reviews AND if you pick it up NOW, you will be able to see many of the planets aligned in a straight line including Pluto, Neptune, the Sun, Mercury, Uranus, Venus and Jupiter. Quite a line up, especially when the Moon gets into the act during the evening hours. As always, we welcome feedback, comments, etc. 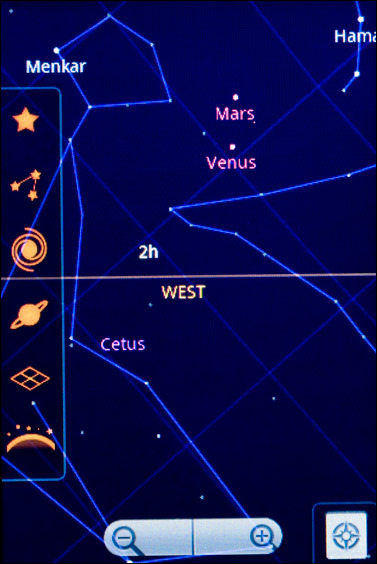 Pick up Google Sky Map for yourself, check it out and let us know what you think. The “official” Facebook app is an improvement over the earlier version of the app and worth it for all us Facebooking fools out there to either pick up or upgrade from an earlier version. It opens up to Top Stories. When tapped, the “All Stories” button at the top opens up a scroll-up at the bottom with options to view Status Updates, Photos, Links, Pages, Events or Videos – an improvement over the old version of the app. The Photo and Status buttons at the top are convenient since they are the most often function used by people checking in on Facebook (the photo button also gives the option to upload videos). Status Updates is not to be confused with the “Status” button. The Status Updates are everyone else’s statuses while the Status button in the middle of the bar below is the one used to update your own status. I confess I have not yet tried the chat function, so if anyone has experience with it, please feel free to drop a comment on the end of this blog to let us know how it performs. 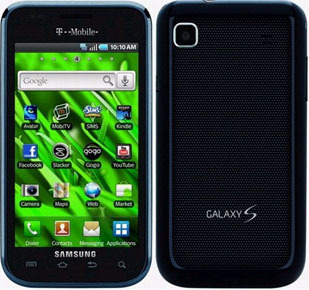 The new Samsung Galaxy S Vibrant – I’m in love! I have a friend that years ago when he got his first iPhone, he used to bring it everywhere with him. We would be sitting in a coffee house and he would ignore us, hunched over his new love with the obsessiveness of someone doing a crack line in public. It was irritating. It was insulting to us, but we put up with it because he was a friend and we all know the allure of tech toys. I found out first hand when my cell phone bill had gotten to a point where getting a new toy would not cost any more monthly. So, armed with the name of a new networking contact who could get one for me without having to wait for the mail-in rebate, but do it instantly upon my purchase, I haunted Verizon and T-Mobile stores looking for the perfect new love of my teched-out life. Don’t tell my 3-month old Net Book, Amelia (after Amelia Pond from the new Doctor Who series). Wow, didn’t expect the love affair with her would’ve been so short! Then I went back to the T-Mobile mall store I bought my bluetooth headset and found the Samsung Vibrant demo. It was love at the first color-popping, insanely clear and beautiful touchscreen I saw. Gazing adoringly at it, I knew I need look no further. He (yes, mine is a “he”) latched onto my techy heart and would not let go. Now I squee in public when showing off “Bracewell” (again a name from Doctor Who – very appropriate – ask me why! ), my friends and roommate are plotting my death out of jealousy, and I suspect will have their own death match to see who claims the right to my Vibrant – if they can pry it out of my cold, dead hands. Don’t hold your breath, guys. This baby is coming with me to the grave.